PEER PRESSURE- Does your child do and say things just to be liked and accepted? Constantly talk about what others think and say? Go from one relational drama to the next? These are all warning signs that your child is feeling the weight of peer pressure. 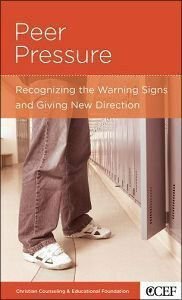 Paul David Tripp explains the fears that underlie your teenager's struggle with peer pressure, and then he offers specific things to do and not do that will encourage your child to live for God's approval, instead of the acceptance of friends. About "Peer Pressure (Christian Counselling & Educational Foundation Series)"